This was the fourth yearly trip that the group organised from London to France and although they had been to Rouen previously, different day trips had been planned to make the experience all that special. 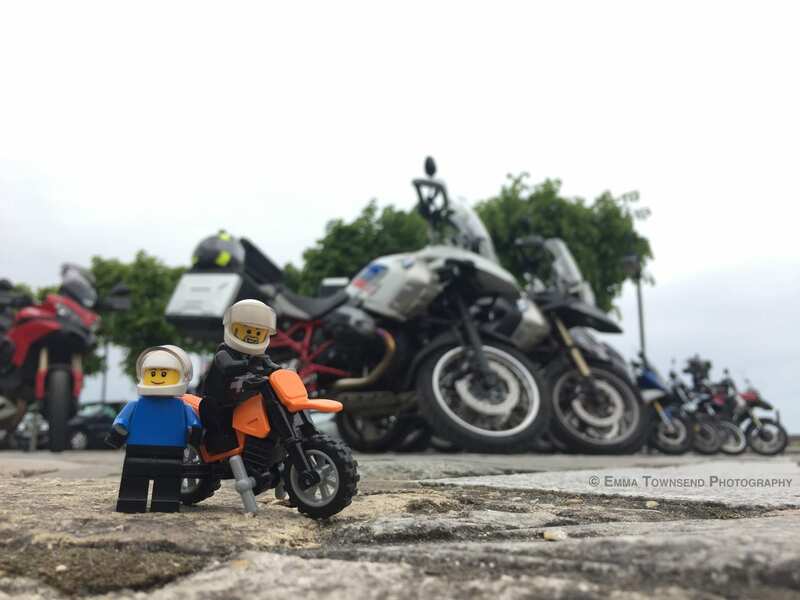 It was however, my first trip abroad on the bike and despite being adamant that I would act as pillion from the moment the trip was announced; a mere week before we departed, it had been revealed that I had a place booked on the EuroTunnel with my own bike. That night we arrived at the Holiday Inn where I revealed all these thoughts and concerns to Steve and Emma over dinner. Propelled with positivity I decided to tackle the next day and put my worries aside temporarily. Managing to get on and off the train successfully without monumentally dropping the bike, the doors to France opened. When we got off, we decided to split off into 3 groups of roughly 7 bikes and in our groups headed towards the hotel via a lovely route. With a few haphazard stop and starts, losing various members of the group on the way, we arrived for our lunch stop. My first taste of a real French Croque Monsieur and I was settled for the remaining route to the hotel. Gliding through some bends on the road, narrowly avoiding a thunderstorm and whizzing around small woodland, the route was highly enjoyable and I found, that as I concentrated on my positioning and riding skills, fear of judgement from the other riders slowly began to disappear. Feeling confident about my capacity to follow a group, use the marking system and ride on the other side of the road, having been filled with positive compliments about my position on the road and general riding from other bikers the previous evening, I decided to take my own bike on Saturday’s planned route. The route was brilliant, taking us through various windy roads and accumulating all its expectation in the final 5 minutes where we hit some wonderful bends on a dual carriageway! Not only was the route phenomenal, but where we stopped to eat, Honfleur, was beautifully quaint on a dock, with lovely restaurants and perfect for scenic photographs. Battling through cobbled stones in order to park the bikes and then manoeuvre them for a perfect photograph, was the only nerve racking part of the day, however, with everyone offering me help and holding on to my bike in case the worst happened I felt secure and highly encouraged. Sunday was hot to say the least, and as we arrived at Deauville I remember distinctly screaming down the headset to Iñigo that I had seen my favourite ice cream parlour, Amorino, and thoroughly believed that I deserved an ice cream and macaron. This beautiful town, with a traditional market, small independent shops, cobbled streets, many fountains and beautiful buildings was by far my favourite town of all. It looked like something out of a fairy-tale story and would highly recommend a visit. Additionally, the route we took from Rouen to Deauville was highly scenic and borderline with a river from the start. Despite this causing an issue on the return to the hotel where we embarked on a ferry catching experience (which is free for bikes), it all rolled into one very enjoyable ride out, with good roads, clear bends and the added excitement of a ferry trip. Unlike the other days, our final day did not consist of a loop leaving and returning to the hotel, but rather a linear path back home to London. Although Iñigo had asked on various motorcycle groups which roads were the most entertaining to take, we found ourselves going straight at many roundabouts, heading through many villages and not touching any bends. Due to this, several riders decided to head straight onto the motorway and attempt to catch an earlier train. The race was on! As a group of us decided to persevere with the original route planned, I told Iñigo that I wanted to beat the other group and the aim had now become to catch them up. But as they say, with great perseverance comes great rewards, and rewarded we were. Great coastal views greeted us as we came across some brilliant bends at high paces, that overlooked World War 2 bunkers and if we squinted hard enough a view of England’s coast. The second half of the route was well worth doing and great fun. The added bonus was that we caught up with those who had abandoned us and we all caught the same train back over. So, how was my first continental ride? Well it as a blast! Much to Steve, Emma and Iñigo’s relief, I am sure, as on Sunday evening I discovered that they had planned the surprise EuroTunnel booking for me to go on my own bike and had panicked greatly when I had expressed my fears on Thursday. Not only that, but I was informed that everyone on the trip had known for some time that I was going on my little Honda, surrounded and guarded by the BMW’s to France, with me, the owner and rider of the bike being the last to be informed! Was it worth it all the nerves though? Yes! My confidence has grown with everyone’s encouragement and helpful tips to improve and correct issues with my riding. I am no longer fearful of the judgement of such an experienced group and I truly relaxed, enjoyed the perfect tarmac and breathed in the stunning scenery and pretty towns. The trip was good and the routes were great, but what made the experience for me, was the people I went with. Their kindness, banter, willingness to help, encouragement and support made me relaxed and I got to know them better through many a laugh over some good French food. The routes of our trip can be found here.